A highlight of a New England winter is the Maine shrimp season. These delightful pink shrimp have a lot going for them. They’re wild, they’re local, and, most importantly, they’re delicious. The season varies each year. This year, it started on January 2, but with a significantly lower quota than last year. The limit is what keeps the population sustainable, but, at the same time, it also limits the fisherman’s income. The whole question of sustainability raises lots of sticky questions. We went to Maine for a quick overnight last weekend, so I stopped at the store to see if they had shrimp. The season is nearly over, but they had some in the case. I picked up a couple of pounds. One thing that’s different about the Maine shrimp is that they are pink even before they are cooked. .They are also really easy to clean: the shells are really thin which makes them easy to peel, and they don’t have any noticeable vein to remove. They are on the small side, but so cute when they cook up. The first night, I made a shrimp scampi over linguine. I winged it, making it like my linguine with clam sauce, but with shrimp. And I simmered the shrimp shells with some butter, lemon and garlic cloves to use instead of clam broth. I didn’t remember to take any pictures, but it was delicious. With the second half of the shrimp, we made a simple paella. This recipe can easily become part of a weeknight repertoire, though the final product is not at all ordinary. The ingredients were few, and the technique a little different, so I’ll admit I had some doubts. The part that made me nervous was the delicate shrimp spending nearly half an hour in a 500 degree oven. I was sure the shrimp would dry out. However, the recipe was Mark Bittman’s and the book was Amanda Hesser’s The Essential New York Times Cookbook, so I should have had more faith. The shrimp was perfectly cooked, as was the rice. The only “note to self” for next time is to add a handful of peas to add some color to the dish. Preheat the oven to 500F. While the oven preheats, heat up the stock and saffron in a saucepan. In a 10-inch cast-iron skillet, heat the oil over medium-high heat. Add the onion and cook, stirring occasionally, until translucent, about 5 minutes. Add the rice, and cook, stirring occasionally, until coated with oil. Season with salt and pepper. Add the warmed stock. There will be a lot of steam, so stand back. If you wear glasses, they will fog. Stir in the shrimp, chorizo, and peas. Carefully, transfer the pan to the oven. Bake about 25 minutes, until all the liquid is absorbed and the rice is dry on top. Serve immediately. Posted on 8 February 2012, in maine, Winter and tagged rice, shrimp. Bookmark the permalink. 5 Comments. I’ve been meaning to try paella! This looks delicious! We got some native shrimp right off the boat about 2 weeks ago. We used to belong to the Eastman’s CSF out of Seabrook, so I still get their e-mails. Will only let me get 10 lbs. because it’s such a process to clean & shell them, but we have about 4 lbs. of shrimp in the freezer, so I think we’ll try this recipe next week! YUMMY! 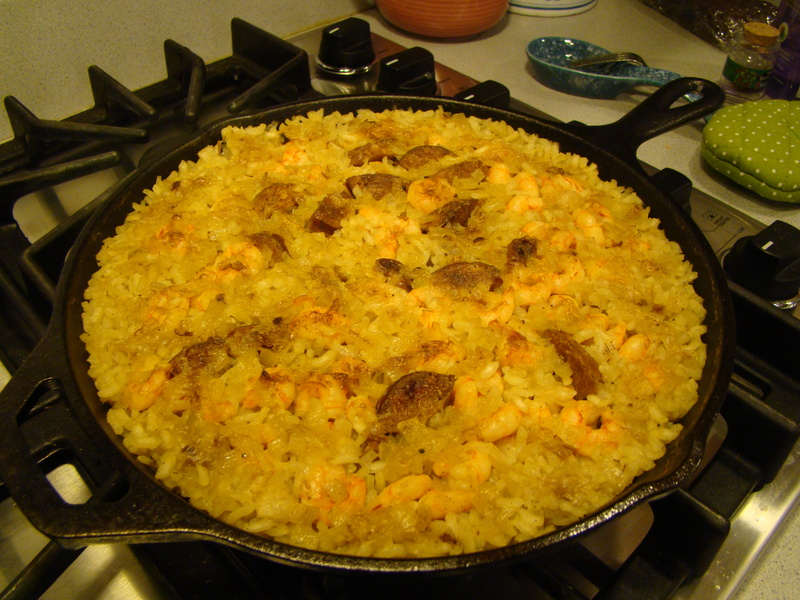 I love paella and this looks like a great recipe! How lucky to get that shrimp! I’ve never had NE shrimp! That’s so cool that they are pink even when raw. You definitely learn something new every day! I really love Paella…looks like a wonderful recipe! A must try! Thanks for sharing!